No contracts or fees- all services are in prepaid blocks. We are FTC compliant for all text and phone messages. Transfer calls are FREE - no conversation time charges. FREE long messages can be up to TWO MINUTES in length. Ring-less voicemails for DIRECT delivery to voicemail ~80%. Private text number with a local area code for $25/year. Volume pricing: texts down to 1.25¢ with calls to 2.5¢. You will have a full TWO minutes to convey your message. Create custom Text-to-Speech messages on the fly using four additional data fields, ringless voicemails, predictive dialer that transfer calls upon answer, use your current phone number for the caller ID we display for phone calls, same low pricing for USA, Canada, Australia, and the UK. We provide outstanding Text-To-Speech voice quality for your late payment or appointment reminders. Statistical reporting and detailed email reports are sent to you after the completion of each job. Automated calling Systems- are they all the same? There are a multitude of robocall systems to choose from when sending your automated phone calls and text messages, but there are several important factors that must not be overlooked when choosing which robocall system to use. Is your data protected with secured encryption? Will your provided phone numbers be sold to another robocall service and your contacts spammed? These are important factors to consider when choosing a safe, reliable automated calling system. The safekeeping of your data will bring peace of mind to your customers and contacts, as well as your IT department. Don't compromise on ensuring your business is 100% shielded from any type of misconduct by selecting the safest robocall software. Wasting your time with a hard to use dialer? An Automated Calling Service should be SIMPLE to use and EASY to see results from. When sending a large number of outbound calls or bulk sending text message, you need to see all the statistics to make fast and smart decisions for your next business move, and how to continue engagement with your contacts. You do not want to waste your time trying to remember how to use the robocall service, when speed, accuracy, and results of call and text campaigns are the most important to your business growth. 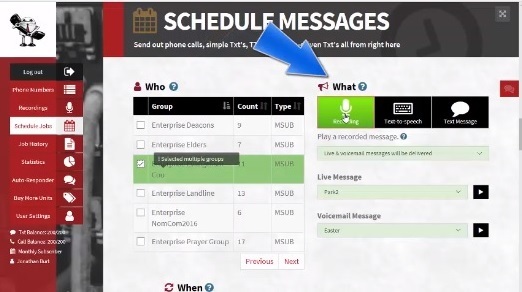 RoboTalker’s automated calling service makes it easy to load contacts, create and save messages, schedule a broadcast, and THEN see the results in an emailed report to plan your next call campaign! We integrated with our CRM and now calls go automatically when we need addtional holiday workers. We contacted our past insurance customers during open enrollment with over 100,000 calls last year with impressive results. Robotalker helped us acquire 1000s of new drivers by automating the onboarding process! We use the Robocalls to send appointment reminders daily and have seen a huge drop in office visit no-shows. We send out thousands of calls each day to our clients for over four years using their API.